The word petroglyph derives from the Greek forms "petro" (rock) and "glyph" (picture); a rock picture, or cave painting. 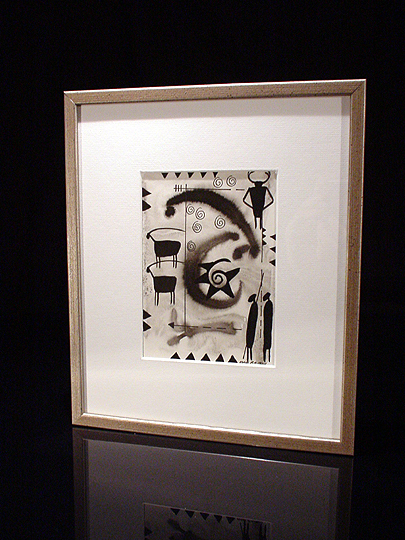 This small work is one of the first of Bob's series of petroglyph works; he has since done a number of larger petroglyphs, many of which are in color. My brother Ward, my sister Lee, and I each have one of these small works. My mom picked out the frame for this one... she chose very wisely. You can see deer/antelopes, a couple of hunters with spears, a sun image, and what I call "the antler guy" in this work. It's pretty cool.